I have studied the light breed "orbs" for some time now and have a few things to say about this topic, the word "orbs" is so stigmatized now that it means nothing and it should stop being used "Thank you skeptics for that". About 5 years ago as far as light breed go I was just like every other conformist, believing everything I heard or read about the light Breed. That's until I decided to find out the truth once and for all. 5 years ago the skeptics would say about 80 to 85% of orbs were dust or moisture and with really no studies it has gradually kept moving up in percentages to what some say now, 99% dust and moisture and maybe 1% spirit. Here is a test skeptics refuse to do or even give it a chance, go out one night and snap some pictures, if you get nothing its time for the test. Call for the Light Breed and mean what you say, like us humans they are not much for ridicule and games either. Give them a few minutes then snap some pictures and if you were sincere they will start showing up. Another thing is I have recordings and a couple pictures when they have answered me and I asked in several states what they call each other and is always "Light Breeds", they are the travelers, the other spirits are grounded meaning they are were they are for a reason, mostly a sin or bad deed that never was forgiven, either by them or a higher power. Orbs is a slang word for any round object. Now for my thoughts about dust which I have experimented on too, for the very first thing, typical out door or indoor dust is a dull battleship grey and the important thing about that is its none reflective, I am in no way saying it won't show up on camera, I am saying it won't show up in a huge ball. If you watch dust under an IR camera you can tell the difference, it shows as small particles and most of it is following the same path of flight. And here is something else to think about before you scream dust in every picture, in every square foot of airspace you breath there are approximately a 100 million particles of dust some way to small to catch with anything, but the skeptics will say only the one or two you catch is dust or its on the lens of the camera and the flash hits it,, that's null and void, the flash does not hit the lens, if it did all your pictures would turn out white. Now what I am saying is fighting words for some but I won't lower myself to argue with them. And if you pay close attention to the loudest ones they all have a friend that works for the camera company. 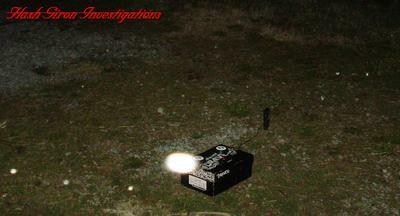 The camera companies would rather remain neutral on this subject, they are not in the Paranormal business. Now they do post a couple of pictures in their directions for use of the camera and what they show is a possibility of what may happen. If all cameras picked up all this dust they would not stay in business to long. Skeptics don't care or even ask if you used a $10 camera or a $3000 camera to them it doesn't fit anywhere in their argument. Now to Moisture, it shows and reflects with no mistake. But I will add that it is one of the four elements that made up all matter and was the cornerstone of by science, philosophy, and medicine for over 2 thousand years. Water is a universal lubricant, for everything and the light breed love it, most times you can spot the intermingled in it. Some will say only the brightest orbs are spirits and the more transparent are dust, I have found this with no basis to it, Light Breed gather energy at different levels, look at it like a car with gas, they more their tank if full the brighter they shine. I am in no way saying all orbs are light breed because then I would be wrong, I am only saying their percentages are way off, you can take bugs and moisture out of the picture because both are easy to spot. We will say or I will say and this is no where near a fact only my honest opinion, 85 to 90% light breed. You can post your video on You Tube. I have a video of myself on there petting my cat and all the while, ORBs are flying through my video. look up Maggie31056 on youtube and you will find two videos with me and my cat. One is titled, "What is my Cat looking at?" and the other one is of me and her, just forgot what I titled it. so fast it made me wonder so I put my IR video camera in my living room. My wife is in the living room with the light on and I'm waiting and viewing the video on my hand held moniter and as soon as she shut the light off I seen one shoot out from the dinning room and up the stairs it went along with two little ones going around the room. I could not hit record fast enough for the big one that went up stairs but did catch others plain as day just flying around the room along with my camera feed cutting in and out... Never had my feed cut out on wifi or hard wired systems and I install secerity cams for my job quit a bit. We're can I post my videos?